So iconic that it inspired a favorite Christmas carol, the gold tone bell has been a beloved holiday tradition for generations. 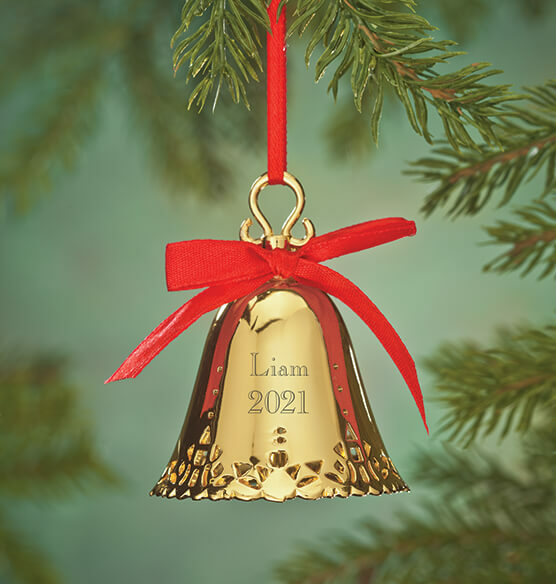 Our personalized gold tone bell ornament, with its festive jingle and shiny good looks, will be a highlight on your Christmas tree. Adults will enjoy its traditional style and nostalgic appeal, and children will likely beg to ring it. The engraved personalization commemorates a name and the year, making this a perfect gift idea. I think the bell ornament is a very pretty decoration for the tree. I wasn't exactly sure whether it would be an actual bell or just a bell shaped ornament when I ordered it. I couldn't tell by the picture. I have purchased a personalized gold colored ornament every year since we married 43 years ago. They are getting harder to find now and I thought either way, whether it was a bell or just bell shaped, it would be cute to have. And I was right! The new parents loved them. They were beautiful and so well done. Thanks for the promptness in my order as these had to travel to Malaysia for my new great granddaughters birth. I have never seen anything like these before and I wanted to get something that they could keep all their lives. I bought 2 bells and they are even better than expected!! They will be a perfect gift! I purchased four bells, gold, silver, rose gold, and blue, one for each member of our family. The bells are beautiful colors, engraved very well, and they even sound lovely when rang. I have been buying ornaments from Miles Kimball for years and have never been disappointed. Used my bell to commentate our 35th Anniversary! It is in my Chinahutch where I will keep it year round! Not putting this beauty away, its way to pterry to it in a box!! I bought one for each of my children and my grandchildren. they look awesome under my tree. it's a beautiful decoration and something for them to have later on . A beautiful tradition! This is high quality ornament that will last for many years. We have brass or gold tone ornaments for every members of our family and spouses and now grandsons. Our tradition in this dates back over forty years. I get one commemorating every pet that has joined the family. The bells are elegant looking, timeless and not 'cutesy'.They are solid enough that they don't lose their shape during summer storage yet are light enough to use in many different decorating schemes. I would have given it 5 stars if the printing had been easier to read. Not if I needed it in a timely manner. I was pleased with the product itself and feel that it is worth what I paid for it. I'm not pleased with the shipnent method used to get it to me. I had to call customer service twice to ask why my package was just sitting in a USPS facility in Dallas, TX, for days on end. I realize that demand increases during the holiday season but other carriers seem to take this into account manage just the same. I give a dated/named ornament every year (since the 1970s) to close family & friends. Make a GREAT gift. The bell itself is lovely and nice quality. The problem is, that it's ruined by the red bow that is sloppily hot glued onto the bell. Why do that? The bow could easily be tied around the top of the bell in the exact same location. Instead, it's tied into a bow and then hot glued onto the gold surface. The glue shows badly and really cheapens the look of what would otherwise be a quality family heirloom. I'm afraid to try to remove the bow or remove the excess glue, because I don't know if it will damage to gold plating. Very disappointed. It's just ridiculous. I am extremely disappointed with the gold bell I ordered. The names engraved on it are barely readable; even knowing what it says it is very, very hard to see. The letters are hardly visible at all! I have been ordering from Walter Drake for several years, but on this particular item I am very disappointed! I was not pleased with this ornament at all. Very poor quality!!!! Sons golden birthday falls the Christmas day. Beautiful ornament - Perfect for our Personalized tree that I love to display!